NTT Inc. - NFPA 70E: What has Changed in 2018? The National Fire Protection Association is the leading knowledge and information resource on electrical, fire, and other associated hazards. The NFPA sponsors the National Electric Code, a standard for the safe installation of electrical equipment and wiring. Every three years, the NFPA updates NFPA 70E, its Standard for Electrical Safety in the Workplace. What changes were made in 2018 and what impact will they have on my business? Planning for job safety – Gone are the days when a simple briefing on job safety was sufficient. Under NFPA 70E 2018, employers have to have a documented system of electrical principles, processes, policies, and procedures that direct activities appropriate for the associated risks of electrical hazards. Labelling equipment – This includes a new option that allows for digital smart labelling in the form of a QR code or a bar code. It enables employees to gain access to hazard information that is normally printed directly on the equipment and allows more space for relevant details such as voltage, current, and energy levels. Procedures for risk assessment – This is probably one of the most significant updates. It specifically requires electrical workers to consider the negative effects of human error on people, equipment, the work environment, and processes. Why is it important to educate employees on new changes? So, apart from stoking everyone’s childhood fantasies of becoming a firefighter when they group, what use is this information to your employees? The 2018 update to 70E is huge. It includes major updates to processes, additional definitions. There are new specifications for hand and arm protection. For example, rubber gloves now have to be retested for insulation before they can be used again. There is a newly prioritized hierarchy of control methods for bringing risk to a more acceptable level. How can training for these changes help employees do their jobs safely and efficiently? Teaching electrical safety by power point presentation just doesn’t cut it. Adults learn by doing. Investing in a two-day formal seminar on electrical safety training based on the 2018 revision to NFPA 70E will pay dividends in terms of protecting your workers by reducing their exposure to electrical hazards. Training your staff will help them to avoid workplace injuries and fatalities resulting from shock, electrocution, arc blast, and arc flash. It will also help your organization comply with OSHA 1910 Subpart S and OSHA 1926 Subpart K.
The hierarchy of human errors and risk controls. Promoted by many safety organizations, the hierarchy of hazard control is used to reduce employee exposure to hazards, in this case, electrical hazards. NFPA 70E standards and training requirements according to OSHA rule 1910.331-335. How to understand the relationship between correct equipment maintenance and the reduction of injuries and deaths. What happens when test instruments come into contact with live parts. How to use the incident energy analysis method to choose the correct personal protection equipment; specifically, arc-rated clothing and other related PPE. NTT Training delivers comprehensive hands-on training and skills-based seminars to workers all over the world. Working with industry’s largest team of expert instructors, NTT brings real-life custom built training equipment into any of your locations. Alternatively, you can transport your staff to one of our hundreds of off-site training venues all over the United States. For information about our training. 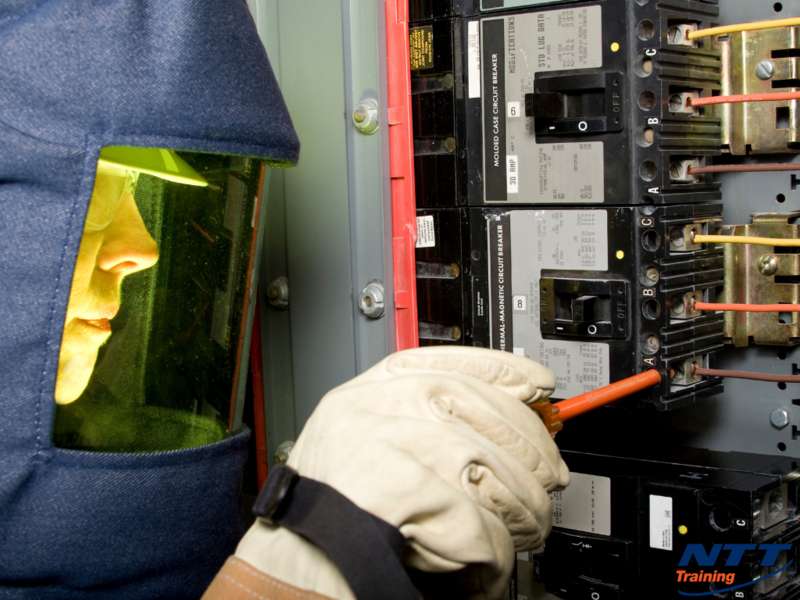 At NTT Training, we offer an electrical safety seminar based on the 2018 update of NFPA 70E. For further information about how we can train your workforce in electrical safety and help your company comply with OSHA regulations, why don’t you give us a call today.